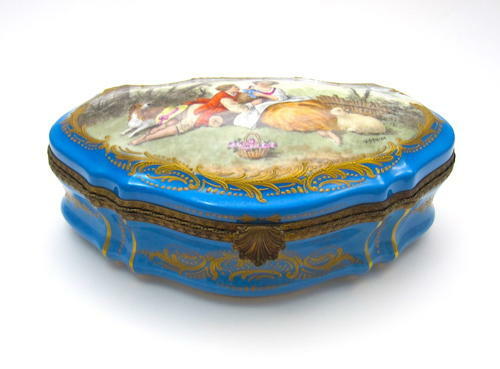 Antqiue Sevres French Turquiose Porcelain Casket Box Decorated with Hand Painted Panels in the Boucher Style. Hand Painted Courting Scene to Cover and Gilded Scroll Work Bordering on Turqupise Blue Background to Sides, Front and Back. It Has a Pretty Pink Flower Design Interior. Mounted with Bronze Frame and Clasp Lock.